People tend to love staring at sunset. The beautiful colours, the moment of serenity and you just want to keep it that way. So take a picture to make it last longer! However, you try and try but you never got that perfect capture just like those Instagram postings. Well, there's special technique to capture a sunset. It's not that hard, just a bit challenging with several tricks on it. According to Jeff Meyer, you just need to set your camera to the right mode. First of all, sunset are all about the correct lighting to get that dim yellow with a small burst of light in the middle. 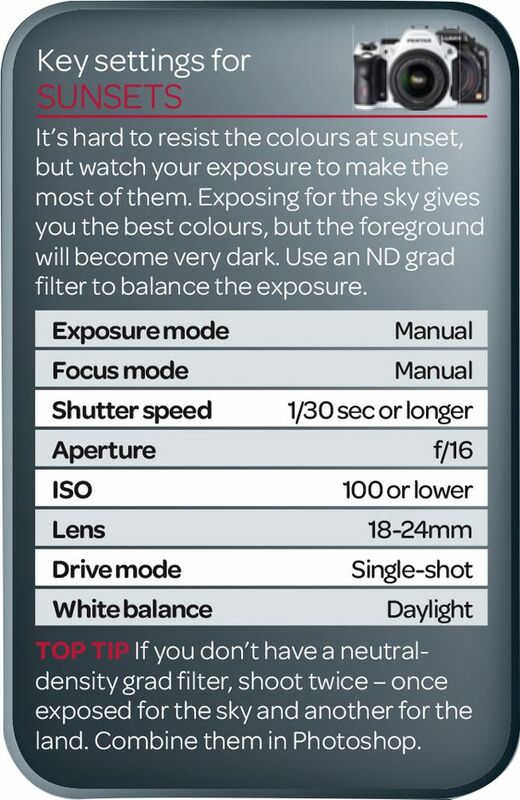 Adjust your camera exposure to manual. I know some of you think "Oh no, this is difficult. I prefer automatic mode!" well, if you want it easy it won't give you a perfection, will it? Make the camera thinks you want it that way, not what the camera thinks it should be. Secondly, focus is another important thing to be careful with. Try to manual focus instead relying the camera to do that for you. If you're on a beach for a sunset, sometimes there's rock, boat, leaves, etc. Try to make those things as a "filler" to your sunset picture. Focus on the part that interest you the most! Last but not least tips, try to capture your sunset in different exposure/ lighting. Take 3 to be safe, one with the bright exposure (a bit too bright), another with mid-exposure and the third with the low exposure so it's a bit dark. Then, combine all of them with the help of Photoshop to make a perfect picture with even brightness. To make it easier, I attach a "cheat sheet" here for your camera setting. The next thing is, have fun to hunt for that perfect sunset!